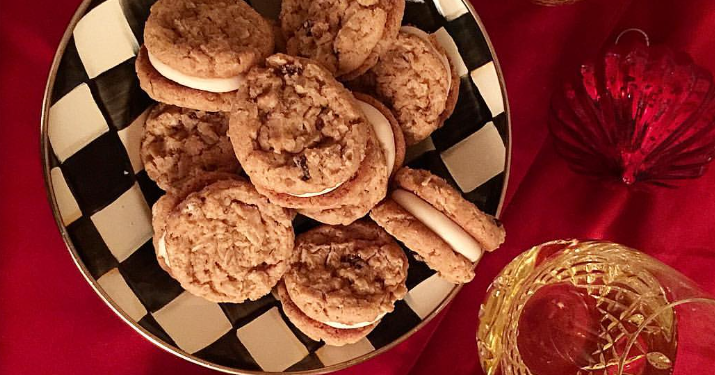 Oatmeal cookies are always a great favorite to serve all year. This is my grandmother’s Oatmeal Cookie recipe and I love making it to remember her. At Christmas, I like a “twist” on the traditional cookies by adding holiday spices and then making them into sandwich cookies. This makes them into a Delicious Christmas Cookie that is simple and easy to make! Step 1: Cream the sugars and Crisco together. Then add the egg and vanilla and beat. Step 2: Then add in the flour, baking soda, salt, and spices gradually, a little at a time. Beat till mixed. Step 3: Now, by hand, stir in the oatmeal. Shape into 3 long rolls on wax paper and refrigerate for 1-2 hours. Step 4: While this is in refrigerator, make the filling to go between the cookies. Filling:1/2 c. Crisco, 1/2 c. butter, softened, 4 c. confectioner's sugar,1/4 t. salt. 1 1/2 tsp. vanilla--Beat the first 2 ingredients and then gradually add the conf. sugar. last, add salt and then beat in vanilla. Put in a quart zip lock bag and cut off corner to pipe onto the cookies. Step 5: Slice 1/2 inch slice and put on ungreased cookie sheet. Bake at 325 for 10-12 minutes. Check and bake until slightly golden brown and crisp on edges. Cool before putting the filling in and making the cookie sandwiches.